A report released today by ICANN shows that the so-called practice of “Domain Tasting,” has all but been eliminated as a result of a solution developed only one year ago. At its peak, the practice of speculatively registering domain names for very short periods of time (less than 5 days) saw millions of dot-com domains, as one example, registered and returned in one month alone. However, following recent policy changes by ICANN after extensive consultations with the Internet community, there has been a 99.7% decline in domain tasting across all registries that have implemented the new domain tasting policy, according to the new ICANN report. “This shows the power of the Internet community working together,” said ICANN President and CEO Rod Beckstrom. “The problem was identified and then a solution produced that has effectively seen the death of domain tasting in less than a year. In this case the study into tasting was prompted by representatives of the user community in ICANN, known as the At-Large community” he said. The issue of domain tasting became a cause for concern when experts warned that a loophole in the system for registering domain names meant that over 99 percent of all new registrations were purely speculative. A combination of new methods of online advertising and advanced automated systems for registering and then dropping domain names meant that people could take advantage of a five-day grace period (called the “Add Grace Period” or AGP) when a domain is registered, which allowed the return of the domain without fee. As a result, millions of domains were registered and then “tasted” to see if online ads placed on the web address would return more than the registration fee (typically between $6 and $7) over the course of a year. If they would, the domains were kept; if not, they were returned free of charge. The solution in brief means that if a company registers and then returns more than a certain number or percentage of domains each month, they are charged for each additional registration above that amount. The result is that domain tasting becomes increasingly expensive the more a company engages in the practice for what may be speculative reasons. Aside from the problem that domain names may have been difficult to register, domain tasting also had a series of negative consequences on the manner in which people used the Internet. If individuals accidentally allowed their domain names to lapse, it had become extremely difficult for them to get the domain back (since it was being picked up and dropped by automated systems). Domain tasting also saw an enormous proliferation in the number of websites featuring nothing but advertisements, thus leading to a form of Internet graffiti. 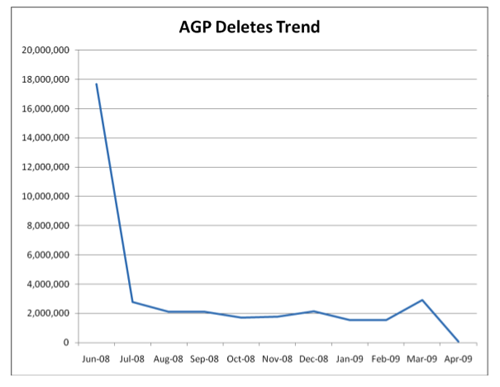 The report provides statistical information on AGP deletes activity by TLD for the period June 2008 through April 2009. It was created to publicize how use of the AGP has dramatically changed following implementation of the AGP Budget Provision and the AGP Limits Policy. The Provision was approved by the ICANN Board and the Policy the outcome of the GNSO Policy Development Process on Domain Tasting.